We look forward to seeing you at the Mercure Brisbane hotel. Enjoy your stay at our 4-star Brisbane accommodation. Feel welcome to contact me: H1750-GM@accor.com or 07 3237 2300. Mercure Brisbane Hotel is located right in the heart of the city, with spectacular views of the Brisbane River and Southbank Parklands. Enjoy the best the city has to offer with the Queen Street Mall, Wheel of Brisbane, Streets Beach, and the Waterfront Botanical Gardens only a short stroll from our Brisbane accommodation. Explore all of Brisbane, utilising the easy public transport system including the Brisbane River ferries only a short distance distance from Mercure Brisbane Hotel. Equally suited for sports fans and art aficionados, Mercure Brisbane provides the ideal base for all types of travellers. This impressive Brisbane hotel is within easy reach of Suncorp Stadium, as well as South Bank, Queen Street Mall and the River Walk. Mercure Brisbane combines style with convenience, providing guests with an excellent range of features, including 24 hour reception and room service, a modern fitness centre, paid car parking, and paid broadband and WIFI access. 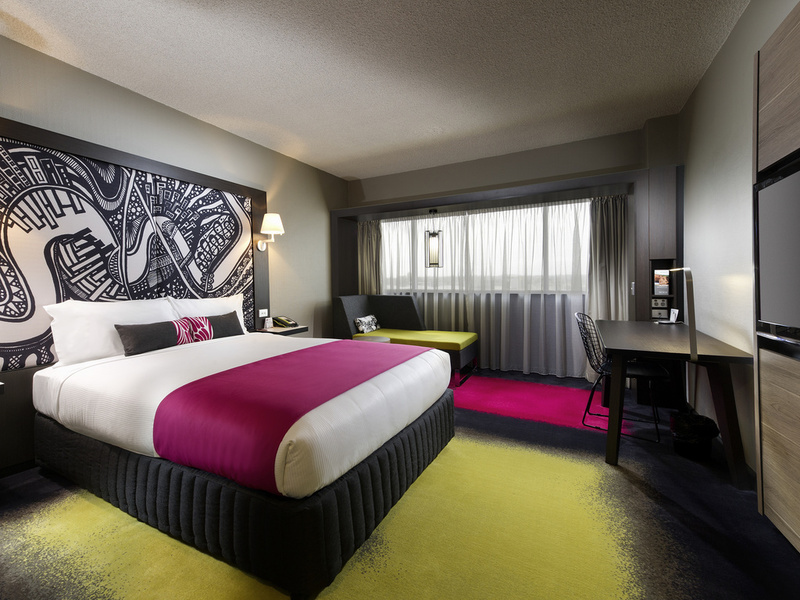 Recently refurbished, guest rooms at Mercure Brisbane offer a range of accommodation options to suit all guest requirements, including Superior, Privilege and Deluxe options. During the refurbishment, Mercure and WMK Architecture collaborated to create a warm yet modern space filled with bright colour, which is both inviting and comfortable. The work of local artist Kelly Fielding was also incorporated into the room design, which includes her range of headboards designed to resemble the Brisbane River. A testament to the belief that wonderfully prepared cuisine is the absolute key to an inspiring dining experience, MRepublic Restaurant and Bar infuses classic cooking techniques with a seasonal philosophy. MRepublic Bar is the perfect destination to eat, drink and enjoy the local surrounds. Overlooking the Brisbane River, MRepublic Bar provides comfortable seating in a casual setting with spectacular views. Bra rum. Rent och snyggt. Liten pool, men helt ok och bada när det är varmt. Personalen i receptionen var helt suverän. Fick hjälp att få ihop en vintur. Trots att allt var fullbokat. Sen när jag glömt mitt koala kort på bussen efter Australien Zoo. Fick jag super service för och få tag på dem. Och korten skickades till vårt hotell i Melbourne. Jag är platinum medlem och jag fick fullt erkännande för min status, drinkbiljett och uppgradering till en fin svit med god utsikt över floden och södra flodbanken. Som vipmedlem blev jag också inbjuden till en timme med fria drinkar som sker på onsdagskvällar. En bra frukost med möjlighet att beställa en omelett. Missa heller inte att äta middag här. Köket lagar mycket god mat. Hotellet ligger bra placerat. Det är bara fem minuters promenad till Queen Str med mängder av affärer. Ett speciellt tack till front manager Sander för den fina presenten. Ett toppenhotell som jag rekommenderar starkt. Mycket bra. Trevlig personal, särskilt Penny. Fina rum. Bra med pool. Fräsch och bra gym. 6st kackerlackor första natten. Fick nytt rum omgående. Rena, rymliga rum. Hade en fantaskik utsikt över floden genom stan. Trevlig personal och bra frukost.